The northern bog lemming ranges across much of boreal North America from the southern two-thirds of Alaska south into northern Washington and east across Canada to the Atlantic coast. In the conterminous United States, it is found near the Canadian border in Washington, Idaho, Montana, North Dakota, Minnesota, New Hampshire, and Maine. Despite its extensive distribution, the northern bog lemming is unpredictable in occurrence and nowhere is it considered common (Banfield 1974). In Minnesota, it was classified as a species of special concern in 1984 due to its rarity in the state. It was first reported in Lake of the Woods County in 1932, and since then less than a dozen occurrences have been documented in Roseau, Clearwater, Beltrami, Koochiching, Itasca, and St. Louis counties. The small number of documented locations in areas of apparently suitable habitat supports the species' listing as special concern. 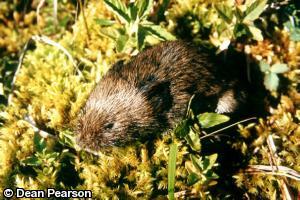 The northern bog lemming closely resembles other microtine rodents with which it may share habitat. Grooved upper incisors, a very short tail (18-25 mm; 0.7-1.0 in. ), and grizzled grayish brown to chestnut colored pelage, with a buffy orange patch at the base of the ear, can help distinguish bog lemmings of the genus Synaptomys from other microtines, such as Clethrionomys, Microtus, and Phenacomys. The northern bog lemming closely resembles the more common southern bog lemming (S. cooperi) and both may be found at the same location. Female northern bog lemmings have 4 pairs of mammae, while female southern bog lemmings have 3 pairs. Species identification can only be confirmed by examining dental and skull characteristics. In the northern bog lemming, lower molars lack distinct inward angles on the outer (labial) edge, the upper incisors frequently have labial spines, and the palate has a sharply pointed spine at its posterior end. Northern bog lemmings typically occur in open, wet habitats dominated by sphagnum moss, ericaceous shrubs, and graminoids (acid peatland and open rich peatland systems). Subspecies exhibit different habitat preferences including conifer forests, shrublands, alpine meadows, and dry sagebrush hillsides (Banfield 1974; Foresman 2001). In Minnesota, northern bog lemmings have been found in open bog, shrub carr, and black spruce swamp habitats (Nordquist 1992). Little is known about this rare species' habits. The diet of northern bog lemmings consists of herbaceous vegetation, primarily grasses and sedges, but they also will eat snails, slugs, and other invertebrates (Foresman 2001). Small piles of clipped vegetation and bright green feces indicate the presence of bog lemmings (Cowan and Guiguet 1973). Northern bog lemmings are active throughout the year, during day and night. They construct well-defined runways or use those of other species. Globular nests of grass or sedge are hidden in short underground burrows, under logs, in sphagnum hummocks, or on the surface under the snow (Foresman 2001). The breeding season for northern bog lemmings occurs from May through August. Gestation lasts approximately 3 weeks. Litters of up to 8 young are possible, with an average of 4 young per litter (NatureServe 2008). One day after giving birth, females are capable of breeding again and young northern bog lemmings are sexually mature at 5-6 weeks (West 1999; Foresman 2001). Predators of northern bog lemmings include hawks, owls, and weasels (West 1999). During the period of Pleistocene glacial advance, northern bog lemmings occurred as far south as Kansas. Today, their distribution has retreated northward into boreal bog and forest habitats. The species is patchily distributed, occurs in low numbers, and likely experiences little-to-no gene flow between populations. The current distribution of northern bog lemmings may comprise isolated, relic populations that are now trapped in remnant post-glacial habitats (Foresman 2001). All Minnesota records for northern bog lemmings are from peatland habitats in the Agassiz Lowlands, Littlefork-Vermillion Uplands, and Border Lakes ecological subsections. While this region has not experienced the level of habitat destruction and alteration observed in other parts of the state, harvesting of pulpwood, peat, and Christmas trees affects the habitats used by northern bog lemmings. Delineating the distribution of northern bog lemmings in Minnesota will be a priority of the Minnesota Biological Survey when surveys are conducted in the Agassiz Lowlands ecological subsection. Large tracts of suitable peatland habitat should be protected where the species is found to occur. Banfield, A. W. F. 1974. The mammals of Canada. University of Toronto Press, Toronto. 438 pp. Cowan, I. M., and C. J. Guiguet. 1973. The mammals of British Columbia. British Columbia Provincial Museum, Handbook 11:1-414. Nordquist, G. E. 1992. Chapter 7. Small mammals. Pages 85-110 in H. E. Wright, B. A. Coffin, and N. E. Aaseng, editors. The patterned peatlands of Minnesota. University of Minnesota Press, Minneapolis, Minnesota. West, S. D. 1999. Northern Bog Lemming (Synaptomys borealis). Pages 655-656 in D. E. Wilson and S. Ruff, editors. The Smithsonian book of North American mammals. Smithsonian Institution Press in association with the American Society of Mammalogists, Washington.